Description: Dabal Bahadur Malla is one of the 14-15 Mugalis who have travelled the distance of 5 days to reach Talcha in Rara VDC from their village Dhaina VDC to fetch rice to feed their family. As a part of the “Food for Work” program run by WFP, they contribute their labor (one person from a family) in road construction in the Mugu-Jumla section, where they get 4 kgs of rice for one day’s work. Almost all the VDC is turning up to receive the rice, with a long caravan of goats and mules; some combining as much as 1200 goats. 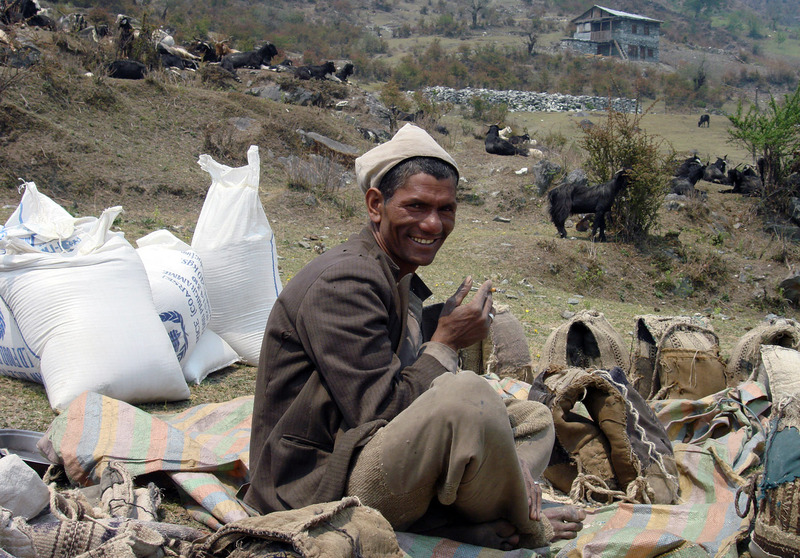 On their trip to Mugu, they bring millet, bean seeds, buckwheat to sell them on the way. Nepal is an agricultural country and here, in Mugu, people are producing(virtually) by contributing nation in infrastructure development and it will still take ( people make such speculations) next 15-20 yrs to regulate that road properly. They have 120 goats with them which are used to carry the small packages of rice (seen in the background).